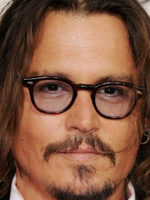 John Christopher Depp II was born in Owensboro, Kentucky, on June 9, 1963. He is the son of an engineer and a waitress, and he lived most of his childhood in Florida. He left school when he was 15 to fulfill a career in music, mostly in garage bands. In 1983 he married his first wife, Lori Anne Allison. To support his family, he startet working as a ballpoint-pen salesman. One time he travelled to Los Angeles with his wife and met Nicolas Cage, who told him he should try to make a career in acting. Depp tried it and got a role in 'A Nightmare on Elm Street'. Success won't arrive till he replaced Jeff Yagher on the TV series '21 Jump Street'. In 1990 he did his first collaboration with Tim Burton on 'Edward Scissorhands', forging a long lasting professional relationship, and a strong friendship. Johnny Depp divorced his first wife in 1985, and after that he has been involved with Sherilyn Fenn, Winona Rayder, Kate Moss, Vanessa Paradis and Amber Heard, whom he married in 2015. He has two children: Lily-Rose Melody (1999) and John Christopher III (2002). He has been nominated to an Oscar three times for 'Sweeney Todd', 'Finding Neverland' and 'Pirates of the Caribbean: The Curse of the Black Pearl', in which we met one of his most iconic roles: Jack Sparrow. In 2004, Johnny Depp founded his own production company called Infinitum Nihil Kootenichela deppi is a 505 million year old fossil named after Johnny Depp because the scientist said there was a resemblance to Depp's character in 'Edward Scissorhands'. After his daughter fell ill, Johnny Depp began to visit the same child hospital dressed as Captain Jack Sparrow to spend some time with the hospitalized children.